Thinking about a personalized treatment for a corporate wall-perhaps a timeline or Mission Statement? Or perhaps you’re considering custom wall paper, with a distinctive color or pattern that reflects your brand or identity? Digitally printed wall covering makes interior spaces individualized to you or your enterprise. Beautiful high resolution photos, wall graphics or patterns can be printed on a variety of materials, including textured adhesive vinyl or traditional pasted wall coverings that meet LEED specs. 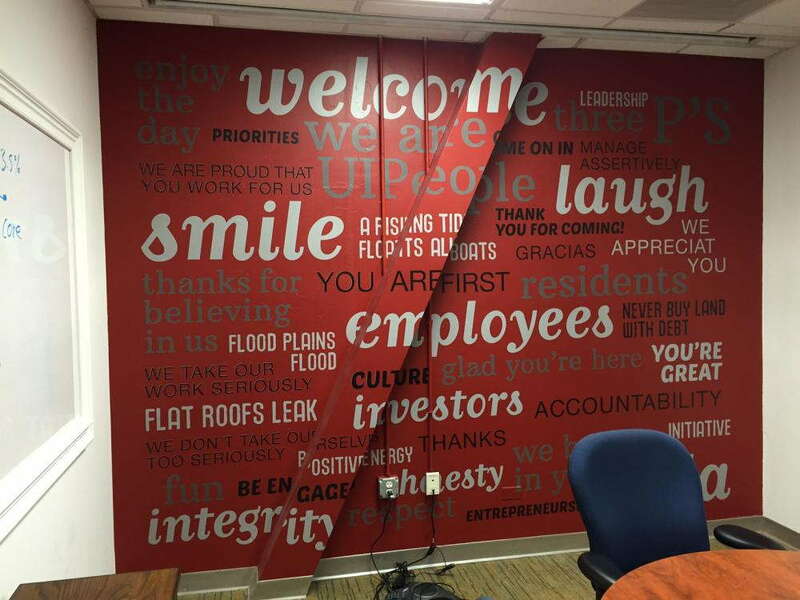 Wall graphics can transform boring surfaces in an office space into something memorable. There’s no limit when it comes to the concepts you can express with wall-scapes. Quotes & Sayings: Are you proud of your Values or Mission Statement? Why not put it up on a wall to inspire employees and inform clients. Create a dramatic view: Feature your City’s memorable views or motifs, or if your office lacks windows, make your own view with images of cityscape, beach view or a memorable vista. Build a backdrop for teleconferencing: Have a backdrop of skyline or choose a vista that signals your location. Where are you on your calls? Not in a plain vanilla office, we hope! Highlight your logo: Brand your space by accentuating your logo in a mural or wallpaper. Sail away: Use peaceful, high resolution ocean, beach or waterfall photos to induce a calm spirit during the busy business day. Informational displays to educate: Let everyone who comes through your doors know about your latest project. Temporary event graphics: What a great solution for non-profit galas or events! Display and inform about your cause with short-term wall murals and graphics! To find out more about custom wallpaper, wall murals and cut vinyl graphics for walls, call us at 301-588-7733 or or submit an inquiry here. That’s how we build our business at SpeedPro Silver Spring.